Can you tell I’m !#%! @@#$@ cooped up in the house this weekend with a hell spawned cold? If memory serves (and it is on the fritz at the moment) this is the third post in three days. Blogging at least keeps my mind off of the missed training runs this has caused which couldn’t happen at a more inconvenient time… but more on that in less than a month. To be honest, today’s post is really more about a half check than a full check on the Life Birding List. Linda and I headed out to a photo shoot at Wildcat Den about 30-40 minutes outside of Davenport in Muscatine County, Iowa. We were in Davenport for our 3 day concert extravaganza (yes, that will be a future post topic) and figured it would be a good opportunity to take some shots at the State Park. So we strapped on the backpacks, cleared out the memory cards and grabbed the cameras. Needless to say with opportunities for wildlife, The Beast was in tow. For the first hour there was not much action in the feathered category. I decided to focus on some large butterflies while Linda busied herself with some water landscape shots. From there we moved deeper into the State Park when Linda (so she says) pointed out a reddish bird sitting in the dense trees. Having learned from previous mistakes, I dropped the tripod down and did my best to get a preliminary shot so I wouldn’t be leaving empty handed. Once I had sufficient attempts from afar, I slowly moved in to try and better the shot. Out of all of them, this is probably the best one. Turns out this was not the best specimen. From the shots below you’ll see that it looked like it had been bathing in the stream or had just passed some kind of bird initiation. 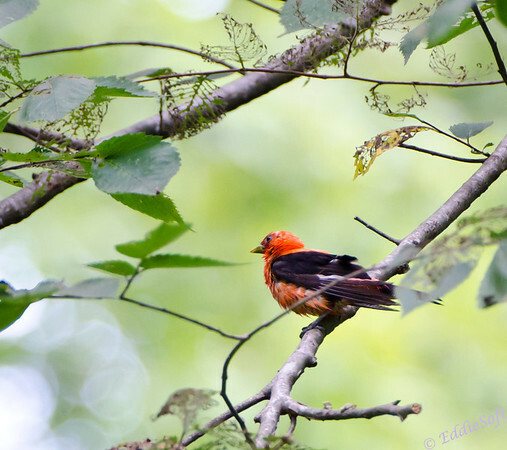 However, based on the visible markings it looks to be a Scarlet Tanager. This was my guess while looking through the lens which added some excitement since this particular bird had eluded me up to this point. To put the difficulty level into perspective, this is was the setting for the initial shots. The beast was fighting the dense branches and traveling back in forth trying to focusing on the leaves that blew into the focus point. I should have flipped it to manual to solve that, but guessing I got caught up in the moment. Even from afar something looked odd about this bird. I really couldn’t put my finger on it, but opted to keep the shutter going rather than chimp at the camera display. 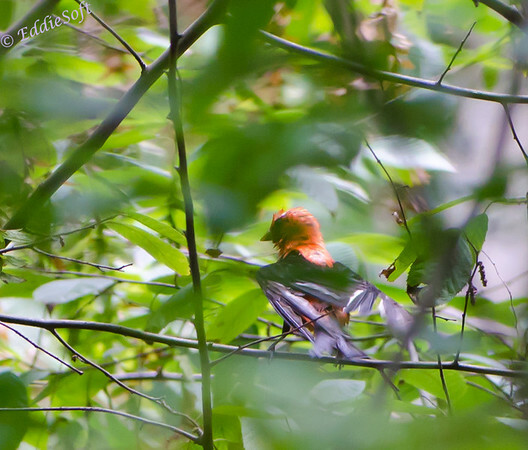 So it was not until post processing when I noticed how disheveled this Tanager was. This shot through the leaves gives the impression it just might have been wet and was trying to dry out its wings. Brace yourself, the next is just downright scary! It almost looks rabid or some early castings of the movie The Crow. I am still going with the soaked explanation and thinking it might have just shook before the shutter was pressed. In a subsequent shot, the body feathers were calmed a bit, but again, the wings look a little sickly. Now both wings were fanned out like a cape or weathered kite. I questioned Linda if she remembers any storms the night before that would collaborate this theory. There were none she remembered. I did do a little research to see if there were any clues there. Surprisingly, the female is actually yellow/green and the male takes on a similar shade in the winter. 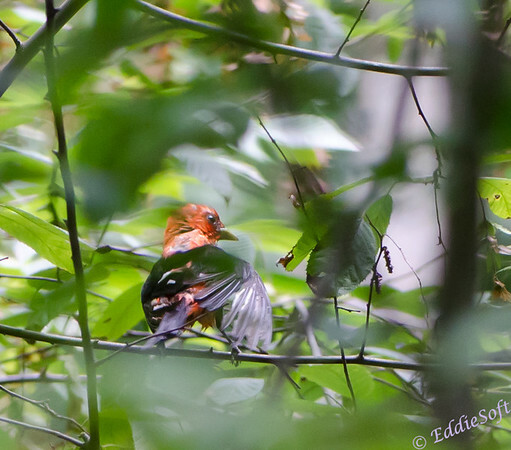 The Tanager tends to feed high in the tree canopy so pretty lucky to see it at all. Their bathing habits were not explained in any of the 5 reference manuals I use so no clue if they tend to dive into water or hang out at the river’s edge. Oh, almost forgot. 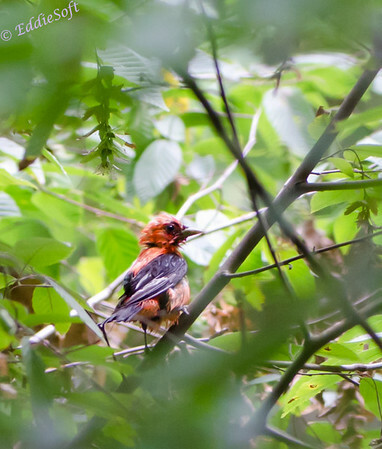 I took out my mobile Audubon birding app and played some of the Scarlet Tanager audio they had. 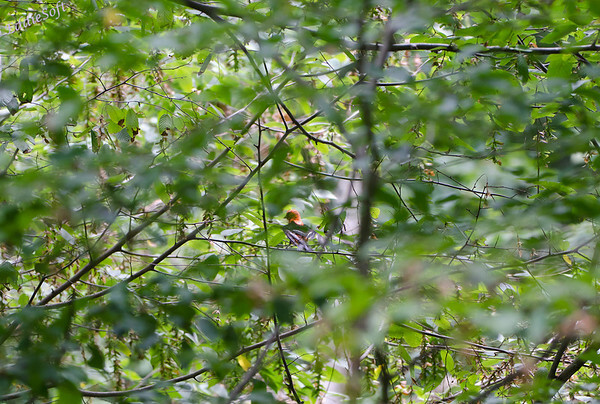 Although not positive, it sure seemed like at least one Tanager was calling back when I played a few of the calls. (Thanks to Skids for pointing that app out to me). So, I can say I’ve seen one Scarlet Tanager and shot it. Hopefully in the future I can locate a specimen that is looks a little better. Until then I’ll put a half check in the book. As far as Wildcat Den goes, I had a great time. There were interesting rock formations to shoot and a fascinating mill that kept me entertained. Given the option in the future, I’d pick Wildcat Den over our local Starved Rock any day. Pretty sure Linda was disappointed at the water flow, but we’ll head back in the rainier months.